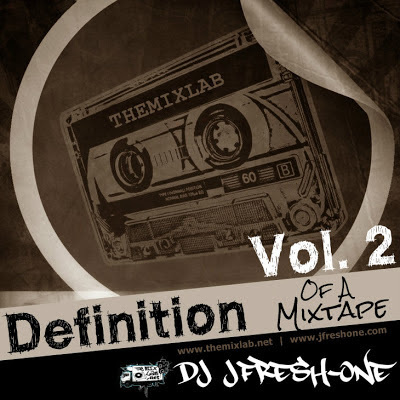 DJ JFresh-One presents the 2nd installment to the previous "Definition Of A Mixtape" which was dropped online in Spring 2012. The main objective to this mixtape is to continue to bring back the true definition to the hip-hop mixtape. The music scene is indeed flooded with mixtape CDs & downloads from the popular artist to the amateur bedroom DJ. Although, majority of today's so-called mixtapes contain either "garbage rap tracks" or wack mixes, most are not really "mixtapes"....they are typically known or should be known either as a "street album", a "demo", or a "promo CD". The tradition of a mixtape in Hip-Hop is based on a performance, a theme or a soundtrack of a DJ and it is presented in a recorded MIX onto a tape (nowadays a digital file). So what Fresh brings to the tables on both mixes is what he claims a simple solution: a true mixtape with straight up Hip-Hop music. Enjoy! Peep out the latest track from the legendary LL Cool J. "Take It" featuring Joe will be on the upcoming album from Uncle L. The new album will be titled Authentic Hip Hop. Throwback: Talib Kweli - "Get By"